Obituary of Stacey Silvio Culpepper (#62487), published 2 Jun 2011. Wikipedia contributors, "Thomas Gargrave," Wikipedia, The Free Encyclopedia, http://en.wikipedia.org/w/index.php?title=Thomas_Gargrave&oldid=433107369 (accessed June 30, 2011). Biography* � Sir Thomas Gargrave (1495–1579) was a Yorkshire Knight who served as High Sheriff of Yorkshire in 1565 and 1569. His principal residence was at Nostell Priory, one of many grants of land that Gargrave secured during his lifetime. He was Speaker of the House of Commons and vice president of the Council of the North. Gargrave was the son of Thomas Gargrave of Wakefield, West Yorkshire, and Elizabeth, daughter of William Levett of Hooton Levitt and Normanton, West Yorkshire. Gargrave was among the most important men of his age, serving frequently on Yorkshire business and at Court. He began his career as Steward of the Household of Thomas Darcy, 1st Baron Darcy de Darcy (often called Lord Darcy of the North), and Gargrave's ambition and drive were immediately apparent. With the help of Darcy's influence, Gargrave rose quickly, becoming Knight of the Shire for Yorkshire, Deputy Constable for Pontefract Castle, Steward of York Minster, Receiver of the Exchequer for Yorkshire, Master in Chancery, and Recorder for Kingston upon Hull. Gargrave's rise was meteoric, from humble steward to Knight of the Realm and one of the most powerful men in England. Sir Thomas Gargrave married Anne, daughter of William Cotton and Margaret (Culpeper) of Oxon Hoath, Kent, by whom he had his only child, Sir Cotton Gargrave, also High Sheriff of Yorkshire. He married secondly Jane, widow of Sir John Wentworth of North Elmsall, West Yorkshire. 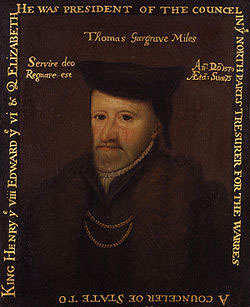 Sir Thomas Gargrave appears as a character in the William Shakespeare play Henry VI, Part 1. In Old Halls, Manors and Families of Derbyshire, author Joseph Tilley sums up the Gargrave legacy as follows: "The Gargraves were a knightly house, who came in for extensive grants of Abbey lands in Yorkshire, but who, within a century afterwards, sank into obscurity. The grandfather of the purchaser of One Ash was Speaker of Queen Elizabeth's first Parliament and President of the Council of the North. He was a favourite of Her Majesty and her minister Burghley; he had a grant from Bess, of the Old Park, Wakefield, but he adopted the glorious old Priory of Nostell for a residence. This was the gentleman who conducted poor Mary of Scots from Bolton to Tutbury." Gargrave was also widely known for his address to Parliament of 25 January 1559 in which he urged Queen Elizabeth I to take a husband and marry. The story of the Gargraves became an oft-cited tale of the rise – and fall – of ambition. Of the Gargraves, it is said, the poet Byron was moved to write: "'Twere long to tell, and sad to trace, Each step from splendour to disgrace." The bulk of the Gargrave properties passed to Thomas Gargrave, eldest son of Sir Cotton Gargrave, who left them to his only daughter, who broke with the family's Royalist sympathies by marrying Dr. Richard Berry, physician to Oliver Cromwell. "Berry," according to one early history, "contrived to make himself master of their fortune, and the whole family sunk into obscurity." No less an authority than Sir Bernard Burke, in his Vicissitudes of Families, was moved by the Gargraves' precipitous fall. "The story of the Gargraves is a melancholy chapter in real life," wrote Burke in the nineteenth century. "For full two centuries or more, scarcely a family in Yorkshire enjoyed a higher position." Subsequently Sir Thomas Gargrave's oldest son was hanged at York for murder; his half-brother Sir Richard Gargrave of Nostell Priory, once High Sheriff of Yorkshire, later wasted his estate, and was reduced to gambling for a cup of ale, plunging his family into penury. Sir Richard was eventually found dead in a London flophouse. "Not many years since," Burke wrote, "a Mr. Gargrave, believed to be one of them, filled the mean employment of parish clerk at Kippax." Sir Thomas Gargrave, oil on panel, unknown artist, 1570. Gift to National Portrait Gallery, London, by Gery Milner-Gibson-Cullum. E-mail written 18 Jun 2011 to Warren Culpepper from Gloria Denise Culpepper Bowden (#57033), e-mail address. E-mail written Jun 2011 to Warren Culpepper from Gay Culpepper Pound (#62510), 19411 Aurora Dr. E., WA 98387-8018, Phone 253-847-8778, e-mail address. E-mail written 14 Oct 2011 to Warren Culpepper from Kathy Sue Culpepper Studley (#62706), e-mail address. E-mail written Jun 2011 to Warren Culpepper from Zak Young, e-mail address. Based on a fan-chart that once hung on the wall of Zak's great-grandmother, Mary Cone Young of Hope, New Mexico. E-mail written 2006-2011 to Warren L. Culpepper from Jeremy David Culpepper (#54772), e-mail address. E-mail written Mar 2011 to Lew Griffin from Loretta (Oglethorpe) Divis, e-mail address.